A seaplane crashed into a Sydney river yesterday, killing six people on a "wine and dine" sightseeing flight ahead of the city's harbour-centred New Year's Eve celebrations. Four Britons were feared dead in the crash. 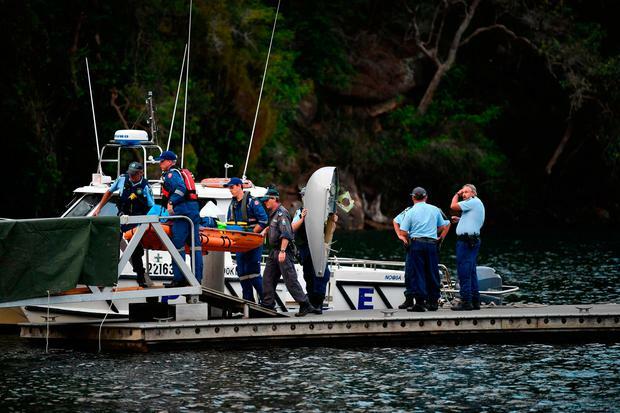 New South Wales Police Force said divers had recovered six bodies from the scene and an investigation was under way to identify the victims and determine the cause of the crash. Six people including the pilot were on board the plane when it crashed off Jerusalem Bay near Cowan, north of Sydney, at around 3.10pm (4.10am Irish time) yesterday, police said. Police said they did not immediately know the cause of the crash, nor the identities of the five passengers, but were speaking with several witnesses who were in boats on one of the waterways' busiest days of the year. The pilot was the sixth victim. Mr Gorman said police were liaising with Sydney Seaplanes to identify the victims and their families would be contacted before they were named publicly. Sydney Seaplanes has been operating since 1938, originally flying from Australia to Britain, a journey that required 30 refuelling stops along what became famous as the "Kangaroo" route. Local reports said four Britons were among the dead. The UK foreign office was unable to confirm any details of the crash, but said British officials are in contact with authorities in Sydney. A spokeswoman said: "Officials from the British consulate are in contact with local authorities. We stand ready to provide consular assistance." New South Wales Police Force and the Australian Transport Safety Bureau (ATSB) are investigating the cause. The ATSB said the single-engine plane operated by Sydney Seaplanes is reported to have "sunk rapidly" after hitting the water. "At around 3pm this afternoon, a DHC-2 Beaver Seaplane, VH-NOO, operated by Sydney Seaplanes was flying in the vicinity of Jerusalem Bay (near Cottage Point)," the bureau said. "It is understood that there was one pilot and five passengers on the aircraft on a return flight to Rose Bay.